1983: Built in 1972, Rivervalley Estate off Swords' Forrest Road had grown to a community of over 1500 homes, achieved parish status and boasted a fine new Holy Family Primary School. The new parish was called after a local saint of the 6th. century, St. Finian. On St. Patrick's Day, 1983, a football challenge took place between a Rivervalley selection and St. Brendans, Loughshinny. The Gaelic soul began to stir. Shortly after, a meeting was held in the Hawthorn Hotel in Swords at which St. Finian's GAA Club was formed, the first Cathaoirleach being Benny Power and Jim Shelly the first Runai. It was decided to register one adult football team and two juvenile teams, U-10 and U-11. With the help of Willie Price, Chairman of the Fingal League and Jim King, then Co. Secretary, St. Finian's was up and running. 1984: First medals come to the club when the U-12's were runners up the North West Football League. The Junior hurlers were runners up the Fingal Parish League and the Junior footballers were runners up Div. 1, Fingal Junior League. A camogie team was also organised in this year. 1985: The Junior hurlers win Fingal Parish Hurling League. 1986: The Club secures a site for a clubhouse close to the pitches. A draw raises £20,000 towards its development. Gaelic Games begin in Holy Family school. 1987: The U-10 footballers and hurlers won their Leagues and the Junior hurlers won the Top Four. 1988: The U-10's win the Dublin B Hurling League. 1989: The U-11 footballers win the North East League while the U-13 hurlers win the C League. 1990: The U-13's winning the C Football League. 1991: The U-12's and U-13 win their football leagues while the U-14 hurlers win Div. 2 of both the Dublin and Leinster Feile. 1992: The U-13 win the League, U-14's the Hurling Feile and U-16 the B Football League. 1993: U-9 Footballers win Special League and Fingallians League while the 16's again win the B League. 1994: The U-16 Footballers win the Premier League. U-10's also win their league. 1995: The Junior footballers win the McArdle Cup, the Sheridan Cup, the Junior 4 League and the B Championship. Meanwhile the Junior hurlers win the E League. 1996: Adult footballers are Runners up Junior 3 Football League. 1997: The Junior Footballers win the Junior 2 League and Parson Cup Competition. 1998: The Junior Footballers win the Conlon Cup while the hurlers win the Top Four Competition. 1999: Junior Footballers win the Joy Cup. 2000: The Footballers win the Junior A Championship and Intermediate 2 League. 2001: St. Finian's win the Intermediate Championship and promotion to Senior Football. The Ladies footballers bring their first League trophy to St. Finian's. 2002: The Junior B hurlers win the League Div. 6 and Millar Shield. Hurling. 2003: The Junior B hurlers win the County Championship. Under 13 hurlers win their league. 2004: First camogie medals for St. Finian's as u-14's win the League. Adult footballers win div 8 & div 12 leagues. 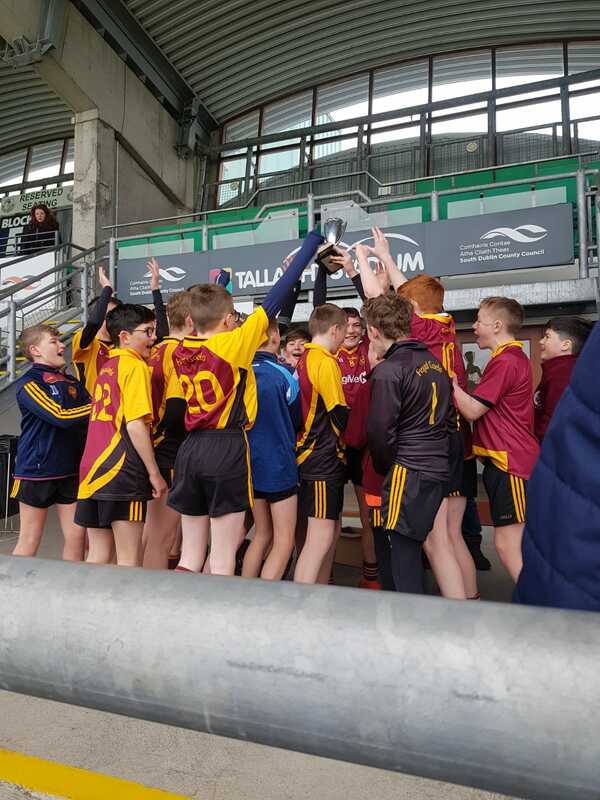 Under 12 hurlers win cup. 2005: Under 14 footballers and hurlers achieve a historic club double by winning both football and hurling feile competitions. Additional history is still in the making!!!!!!! 2012: Adult football team wins Division 3 and promotion to Senior status in Division 2. Our Adult hurling team reached the final of the Junior B Hurling Championships but lost out to a strong Lucan Sarsfields team.